Alberto graduated in Economics and Business Studies from Deusto University and he is a member of the Spanish Official Register of Auditors (ROAC) and the Institute of Chartered Accountants. Earlier in his career, he worked in the field of auditing and consultancy at Arthur Andersen and Audihispana (1983-1987 and 1990-1992), and in the field of financial-economic management at Heraclio Fournier (1987-1990) and Corporación Patricio Echeverría (1992-1997). He joined Euskaltel, S.A. in 1998, initially as Chief Financial officer and Controller (1998-2000), before becoming the Managing Director (2000-2011) and is currently the Chairman of the company. He is Deputy Chairman of BBK Fundación Bancaria, Board Member of ITP, Deputy Chairman of Orkestra-the Basque Competitiveness Institute, Member of the Board of the Novia Salcedo Foundation and Member of the Advisory Board of Mondragón Innovation & Knowledge (MIK), the Euskaltel, S.A. representative on the Board of the Guggenheim Museum Bilbao. Francisco Arteche graduated in Industrial Engineering from the University of Navarra in San Sebastián and has an MBA from the IESE Business School in Barcelona. With a long and prolific career behind him, he has held executive posts in the technology sector for 20 years and he spent the last eleven years at Microsoft, the world leader in applications and software. Prior to joining Euskaltel, he was the General Manager of the Microsoft Ibérica Consumer Channel Group, a company which he joined as Director of the Entertainment & Devices Division for Central and Southern Europe and, subsequently, for the whole of Western Europe. Previously, he had been the General Manager of Electronic Arts (EA) for Spain and Portugal, where he worked for seven years. Francisco is a member of of the ICA (Institute of Corporate Directors) and has been a member of the Board of ISFE (Interactive Software Federation of Europe), along with being the executive sponsor within Microsoft on the AECOC Board (the largest Spanish Association of Manufacturers and Distributors) and Chair of the ADESE (Spanish Association of Software Manufacturers and Developers) sectoral association. As part of the consolidation process as a telecommunications group operating on the markets of the Basque Country, Galicia and Asturias, the Euskaltel Group has defined an organisational structure that pursues excellence and competitiveness on its three benchmark markets. 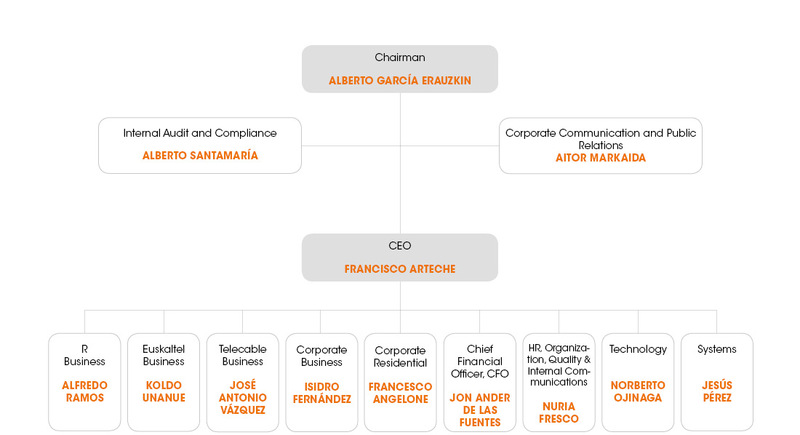 The Euskaltel, R and Telecable organisational structures have been adapted to continue to grow, strengthen customer orientation, develop communication solutions for companies and private customers, maximise synergies and, consequently, to increase the results of the Company, while ensuring the rootedness and autonomy of the business units in the Basque Country, Galicia and Asturias. On the one hand, customer outreach has been reinforced, by ensuring the local rootedness of the brands on the markets of the Basque Country, Galicia and Asturias, fostering the autonomy of the Euskaltel, R and Telecable business units, tasked with overseeing operations, and by guaranteeing service, assistance and working closely with the customers. The new structure also enhances the focus on the business segment on both markets. On the other hand, areas have been developed that reinforce the growth channel of the Group in the Basque Country, in Galicia and Asturias, with the setting up of Corporate Marketing and Innovation areas, to develop and implement specific communication solutions for companies and private customers, the launch of new products, and the search of technology alliances in the ICT field. This organisational structure likewise seeks to maximise operational efficiencies and the Economic-Financial, Network and Human Resources corporate directorates have therefore been created. These cross-cutting areas ensure streamlining, uniformity and flexibility in decision making, by leading the Group's teams in the Basque Country, Galicia and Asturias. These key points are the cornerstones of the composition of the first-tier organisational structure of the Euskaltel Group.